The Le Sigh: Video: Winter - "Bedroom Philosophies"
Video: Winter - "Bedroom Philosophies"
scene in a romantic 80s movie aka we loved every second of it. Sadly, I never attended school dances, but if I had I’m sure the band wouldn’t have been as cool as Winter. “Bedroom Philosophies” gives listeners a first glance at the two piece turned quartet, with a pan to each of the members rocking out in this romantic lo-fi number. The dimly lit soundstage and dreamy vocals are eerily reminiscent of a high school dance scene plucked from the culminating scene of a romantic 80s movie. Front woman Samira Winters glistens in actual glitter and pink, her sludgy strums plucking away flower petals attached to her guitar strings, hypnotizing you with wistful stares and her floral crown. The appearance of flowers from the drum kit to the bass guitar play off the innocence of “Bedroom Philosphies”, reappearing in later dance scenes and careless petal plucking sessions. “It’s always you and me forever,” Samira sings and this video will have you wishing for an eternity under her spell of your own. 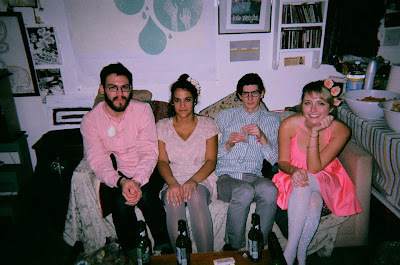 “Bedroom Philosophies” comes from the group’s previously released Daydreaming EP, a fitting title for the playful, but lighthearted nature of their music that resembles the bedroom pop of Dum Dum Girls or La Sera. From the pleas for a day of disappearing and dreaming on the metallic “Your Eyes” to the slowed down chills and swirling keys on the dark “Nothing” Daydreaming seems almost a short glimpse into the daydreams of Winter. If only all daydreams could be this blissful and sweet. Lauren Rearick, a freelance writer from Pittsburgh, PA who has an unhealthy obsession with teen dramas, mainly Vampire Diaries and securing a reality show deal with Bravo. That probably won’t work out so she writes a lot and dreams of Wolf Parade reuniting.